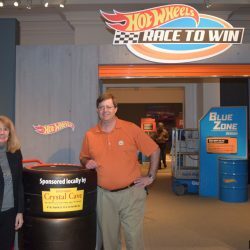 Reading, PA – Buckle up and race over to the Reading Public Museum to check out the latest exhibit, Hot Wheels™: Race to Win™. This new family exhibit will get you revved up with immersive activities for three generations of Hot Wheels® fans. Hot Wheels: Race to Win makes a pit stop on January 21 and will be on display through April 25. Children and Families will love the Pit Stop Challenge in which they can race the clock – and their family and friends – to change tires and refuel the car. A 6 lane downhill speed track, booster power track, adjustable angles track, and timing track are just a few of the ways visitors will be able to test their theories regarding the science of racing and cause and effect. Real race car parts, authentic artifacts, and captivating memorabilia will round out the experience. Introduced by Mattel in 1968, the “tricked-out” toy cars have come a long way (both in the die-cast and life-size varieties). More than 800 models and 11,000 variations of Hot Wheels cars have been created and more than 4 billion Hot Wheels die-cast cars have been sold. Don’t miss the opportunity to push the limits of your imagination and learn about the world of racing in this all-new exhibit. Hot Wheels™: Race to Win™ is produced by The Children’s Museum of Indianapolis and Mattel. The Children’s Museum of Indianapolis is a nonprofit institution committed to creating extraordinary family learning experiences across the arts, sciences and humanities that have the power to transform the lives of children and families.